Star Wars Rebels: A New Hero weaves the story of Ezra Bridger with Ralph McQuarrie inspired concept art created by the Rebels animation team for the animated series. Aimed for children beginning or practicing paragraph reading comprehension, the full-page visuals assist emerging readers in understanding the age-appropriate text. The story is told from Ezra Bridger’s perspective, the focus character of the series and the character most children will identify with as the show develops, since he will experience the essence of Star Wars for the first time, along with many other young viewers. From detailing his home planet to describing the woes of Imperial rule, Ezra has much to say, despite his loneliness and desperate need to find himself. That’s where the rebels come in! Ezra takes you through a basic introduction of each new friend and their role on the starship Ghost. His description for Sabine was my absolute favorite as it comes from an awkward 14 year old boy with a minor crush. What made the book all the more delightful were the positive words of encouragement, “Believe in yourself,” because ultimately, each individual person is capable of doing great things. Ezra went from being alone and thinking for himself to gaining a family and putting others before himself–that is a powerful message and a good example for children of his age. To flip through the pages filled with concept art alone is enough reason to add this book to the shelf. The story flows well from beginning to end with challenging vocabulary, complex sentence structures, and topic sentences and key words in bold and capital letters. The book also acts as a great introduction to the Star Wars universe for young readers looking to understand more or parents interested in taking them to that galaxy far, far away. 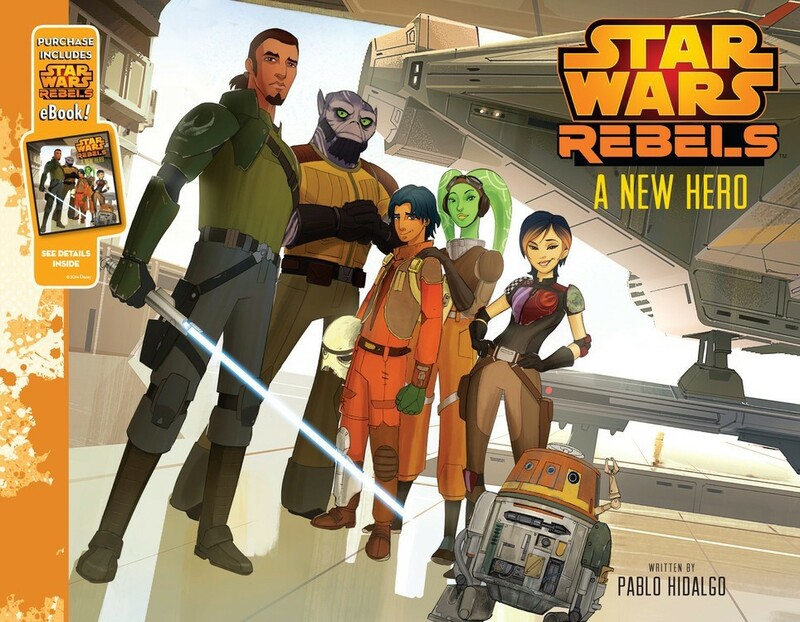 Star Wars Rebels: A New Hero is currently available for purchase, and if you buy it from Amazon, your copy will include a replica eBook for convenient access. If your desire is to only have the eBook, the Kindle Edition is also available.